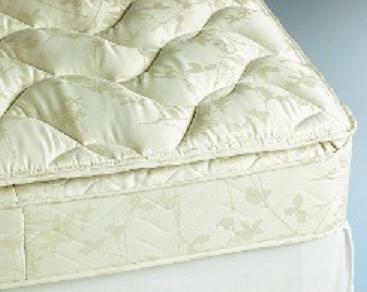 Prestige mattress. Please note: Photo is not direct representation. Our Prestige Mattress is the result of many, many months of searching for a good, comfortable, durable high-quality mattress in Mexico. It was not easy to find. We were thrilled when we came upon this one! This is a very good mattress, with over 432 springs (the full size), made of cushioned fabric -- 100% anti-bacterial cotton, and featuring top cushioning on one side for increased comfort. Mattress is surrounded by an invisible frame which helps it retain its shape even after many years of use. Please note: For our top-notch best ever highest quality and comfort mattress, please ask us about our "Super Prestige" -- these are the mattresses our Gringo Furniture founder has in her own Mexico homes and they are oooh-ahh-mazing. We do not feature them on the website, but would be happy to quote them for you.